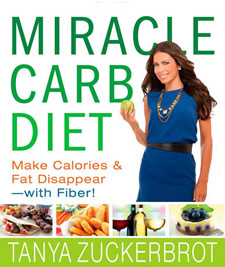 The Miracle Carb Diet was created by Tanya Zuckerbrot, a New York health consultant with a master’s degree in nutrition. She believes that when you want to lose weight, addition is better than subtraction, so you don’t feel deprived. Her secret is to add the Miracle Carb to your diet. That way you can continue to enjoy delicious and satisfying foods while you drop excess pounds. Tanya is also the author of the F-Factor Diet, but she’s describes her knew diet as “new and improved”, incorporating all the new information she has learned since F-Factor was first released. The Miracle Carb is dietary fiber and you probably aren’t getting enough, even if you eat a healthy diet. When you focus on increasing your fiber intake you will naturally lose weight. Zuckerbrot claims that you can lose up to 12 pounds in the first month on the Miracle Carb Diet. Increasing fiber intake can also assist with the management of chronic health conditions including diabetes. You can also have lean proteins, healthy fat, and as many non-starchy vegetables as you like. Alcohol is also permitted in moderation. In the second stage you can have an extra serving of fruit each day. Alternatively you can include a portion of beans, peas or lentils. This stage of The Miracle Carb Diet allows you to customize the Miracle Carb Diet to suit your lifestyle and personal preferences. By now you have learned how refined carbohydrates can cause weight gain. You will have also discovered how eating the right carbs can help you achieve and maintain your ideal weight. You may choose to treat yourself occasionally but in your everyday life it is best to avoid refined carbohydrates completely. High-fiber crackers, high-fiber cereal, whole wheat pasta, nonfat plain Greek yogurt, low fat cheese, eggs, chicken breast, lean beef, pork tenderloin, lamb, tuna, salmon, hummus, raspberries, blueberries, asparagus, beets, broccoli, cabbage, hearts of palm, salad greens, avocado, nuts, olive oil, salsa, mustard, sugar-free Jell-O, diet cocoa, diet soda, red wine. The Miracle Carb Diet helps you reduce your calories without feeling hungry, which makes it easy to lose weight. However adding muscle by weight training will enhance your physique as well as boost your metabolism. When you combine both diet and strength-building exercise, they work together to help you successfully achieve your goals. The Miracle Carb Diet: Make Calories and Fat Disappear – with Fiber! retails at $24.99. High intake of fiber can help to reduce appetite. May assist in the management of diabetes. Meal plan is somewhat flexible depending on your preferences. Includes a collection of high-fiber recipes and meal suggestions. Alcohol is allowed in moderation and the book includes recipes for “guilt-free” cocktails. Meal plan does not consider the needs of dieters with allergies or intolerances to wheat and dairy products. Some dieters will experience digestive discomfort when increasing fiber intake. Miracle Carb Diet advocates the use of several “diet” products including diet soda. Does not provide any particularly new or groundbreaking information. Structured meal plans are not provided. The Miracle Carb Diet is a healthy eating plan to help you lose weight by increasing your intake of fiber. Dietary fiber reduces your appetite because it makes you feel full and satisfied. So on this plan it is easy to cut calories without feeling hungry or deprived, which makes weight loss easier. Hagloch, S. B. (2012). The Miracle Carb Diet: Make Calories and Fat Disappear-With Fiber!.